Now that the cold weather is keeping everyone inside, it’s a good time to take a break and lose yourself in a good book. 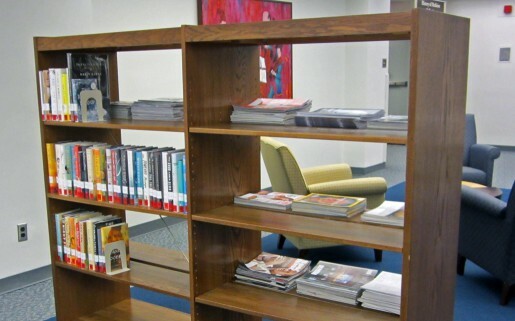 Come explore the new LeisureReading@HSLS Collection in Falk Library. The LeisureReading@HSLS Collection is a revolving collection of newly-published, general fiction and non-fiction books, as well as a selection of popular magazines. The collection is located on the main floor of Falk Library in the comfortable seating area just before and to the left of the History of Medicine Department. 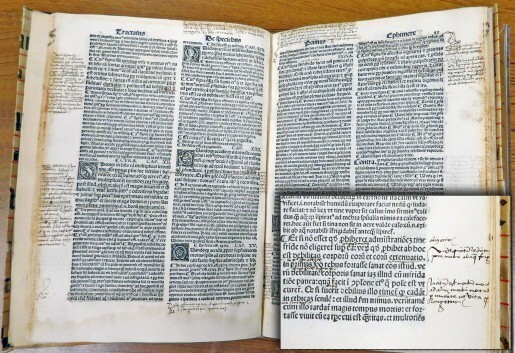 The oldest book in any of the HSLS collections is Expositio in primam fen quarti Canonis Avicennae De febribus, Giovanni Arcolani‘s commentary on fevers in the first fen [section] of book four of Avicenna’s Canon. It was printed in Venice in 1496 by Bonetus Locatellus, one of the most prominent Venetian publishers, whose monogram appears on the last page. The book contains many examples of marginalia, hand written notes by scholars studying Arcolani’s text, and includes drawings of a small hand pointing to important passages. It also has fine wooden capitals [decorated initial letters]. The book was rebound on Gregorian chant parchment. When it was rebound, the pages were cut in the process so there is a minimal loss of marginalia in the HSLS copy.